I graduated from Grand Rapids School in 2004 with my High School Diploma, then it was off to University. I have beenattending Brandon University since the fall of 2004. In May 2008 I graduated with my Bachelor of General Studies (now known asthe Bachelor of PhysicalEducationStudies)with a major in Physical Education and a minor in History/Native Studies.I am currently in the final days of myBachelor of Education After Degree.My final 7 week practicum begins March 8th in Grand Rapids, Manitoba. In May of 2008 I received a Business Council of Manitoba Aboriginal Education Award which was a $3000 bursary. I have been an active member in the Brandon University Physical Education Club (BUPEC). In this club we created professional development opportunities and awareness of being physically active. I sat on the board as the Secretary Treasurer for one year. I have also volunteered my time at a local elementary school helping with their Families And School Together (FAST) program for the past 3 years. I have volunteered with the same school for their Multi-Age Grouping days. I brought in Aboriginal artifacts for their scavenger hunt and for them to learn about the items. That day I also helped in the kitchen with students and teachers baking bannock, the traditional aboriginal bread. Over the summers I have alsovolunteered in my home community, Misipawistik Cree Nation,on various occasions. We had a National Cree Gathering on our reserve in 2007. Ivolunteered my time helping in the organization and administration of the many events that took place.All of the accomplishments I have achieved have helped tosculpt me into the person I am today. 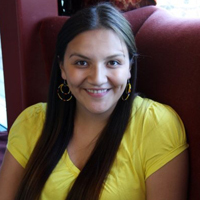 I am a proud23 year old Aboriginal woman from Misipawistik Cree Nation. In August of this past year I married the love of my life, Tyler Lavallee. We are both in our final year of our Education Degree graduating in May of this year. I have lived on the reserve my entire life with my parents, Reginald and Linda Ballantyne, my older sister Monica, my younger brother Reggie and my 8 year old niece Ainslee Rebecca. My parents always stressed the importance of school, family and education. I attended Grand Rapids School from Nursery to Grade 12. I graduated with the biggest class Grand Rapids School ever saw, 22, which led me to where I am today. Just like every other Grade 1 student I wanted to be just like my teacher – she is an exceptional woman. From that year I wanted to be a teacher, although throughout the years I have probably changed my mind about a million times. It wasn’t until my 2nd year of university that I decided to pursue my childhood dream and become an early years teacher. I have loved being in Education and getting the experience of working with children. I have found what I want to do for the rest of my career – work with kids. This is adifficult question. When I think about my personal philosophy I think back to a quote a friend of mine had onthe wall of her classroom. It said “hard work = opportunity”. This quote spoke to me in many ways. I have overcome numerous challenges to be where I am today in my life. This has been one of the hardest and most rewarding experiences of my life – a challenge to say the least. I feel that I have worked extremely hard to be where I am today and could not have done it without the support of my husband, my parents and my siblings. As I matured through University I began to take my role as a student with immense pride and dignity. In my education classes I was the only person of First Nations decent – that made me feel both proud and scared at the same time. No one can understand the amount of pride I felt being in these classes. I was scared because I was in an unfamiliar setting with 20 other people who were different than me in many ways. However, through hard work I feel I have given myself the opportunity to have the best life possible. When I become a teacher this is something I am going to stress to my students – I truly believe through hard work you become the best person possible. In the next 5 years I see myself as an Early Years Teacherwithin the FrontierSchoolDivision. I attended a Frontier school from Nursery to Grade 12, as well as having the opportunity to work for them as a substitute teacher. This wonderful experience has showed me what a great school division Frontier is and it wouldbe a pleasure to be able to work for them as ateacher. I want to continue tolearn andprogress in my skills as a teacher.Something I have considered iscoming back to Brandon University toobtain my Masters in Education. However, right now I am ready to begin my life as a professional teacher. In my personal life Ihopeto be happily married to my best friend, travel the worldand have started our own family.